A couple weeks ago, VeriFone went after a much smaller competitor in a very public way. It accused Square, Jack Dorsey’s mobile payments startup, of a serious security hole which turned out to be not particularly serious at all. VeriFone was trying to spread major FUD (Fear, Uncertainty, and Doubt) and use it to promote its own competing, late-to-the-party PAYware Mobile product. Dorsey responded and there was a huge backlash against VeriFone on Twitter, obviously, and elsewhere. Be Secure. Not Square. Trade in your Square credit card reader for a free, SECURE device from VeriFone. Free Trade-in offer! This is nothing more than FUD marketing. Square is no less secure than handing your credit card to a waiter or a merchant who could theoretically steal your credit card number. And it is the credit card companies who are on the hook for fraud, not the consumer or the merchant. 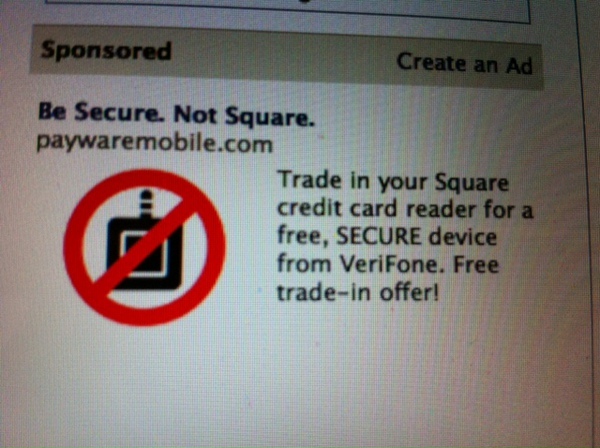 If anything, the fact that VeriFone—a huge, publicly-traded company with $1 billion in annual revenues—is basing the marketing for a new product on trying to discredit Square rather than on the advantages of its own offering tells you more about VeriFone’s desperation than Square’s failings. When they start fighting you tooth and nail, that’s when you know you’ve won. (Hat tip to Tristan Walker).